Can Zinnias Grow in Part Shade? If perennials are the class acts of the garden, annuals are the speed freaks. Annuals must germinate, mature and bloom continuously until they set seed, all of which require extraordinary amounts of energy -- and all within one season. The faster annuals grow and more they bloom, the more sun they need. Zinnias need full sun for best growth and full flowering. Read the planting directions for zinnias (Zinnia spp.) on the back of a seed packet or a plant tab in a nursery cell pack and it will likely advise planting in full sun. But the difference between full sun and part shade can vary. Your annual garden may bask in sun from 8 a.m. to 8 p.m. while your neighbor's yard receives full sun only from 10 a.m. to 4 p.m. -- zinnias can thrive in both. Any garden that gets less than six hours of sun qualifies as part shade. The shade might be dappled, light or full, depending on the obstruction -- as in shade from a deciduous tree, hedge, building or canopy of evergreens and may predominate during the rest of the day -- but to be considered full sun, the area must get six or more hours of unobstructed sun per day. Native to Mexico, zinnias are tender annuals, meaning they succumb immediately to frost. Planting either seeds or seedlings of zinnias must begin after the last frost date. The time from germination to maturity is short -- from eight to 12 weeks, depending on cultivar. In cool, northern climates where the growing season is short, plants started indoors and grown for three to four weeks under bright lights -- zinnia seeds need light to germinate -- can begin blooming as summer arrives. New buds form while flowers bloom, so deadheading keeps the plants blooming. Planting seeds at two-week intervals also lets you enjoy continuous blooms. Although zinnias love heat and tolerate drought, they bloom best when watered during dry spells. Green plants use sunlight to produce carbohydrates, or sugars, in cells called chloroplasts. The chlorophyll in these cells give zinnia leaves their green color. The carbohydrates fire the processes that convert nutrients for the plant's use in making plant tissue -- and flowers. 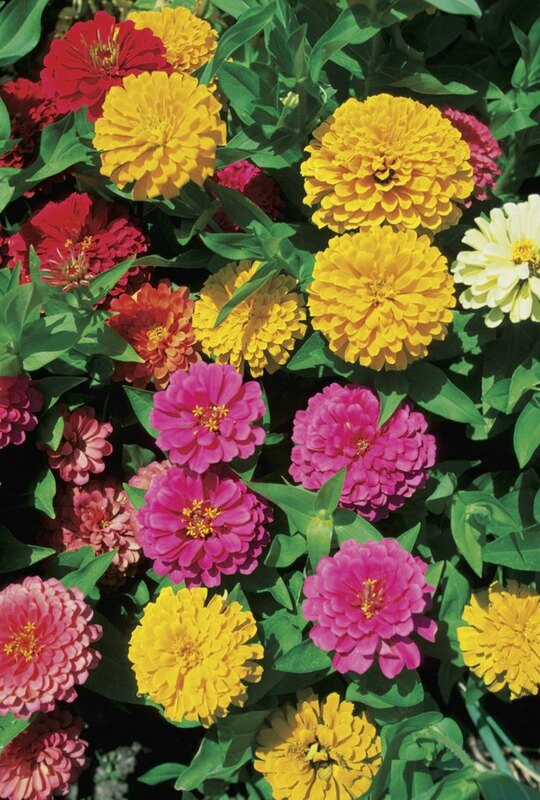 In annuals, such as zinnias, where growth rate is fast and flowering is continuous, photosynthesis must supply a reliable stream of carbohydrates. Too few carbohydrates results initially in fewer flowers and eventually in less growth. While it is possible to grow zinnias in less than six hours of full sun each day, zinnias in even light shade might produce fewer flowers on smaller plants. If your wish is to grow 4-foot tall garden zinnias (Zinnia elegans), you should aim for as much sun as possible -- and as much light as possible during the rest of a long summer day. Another concern with planting zinnias in part shade is powdery mildew, a fungal disease that thrives in cool, humid areas where air circulation is poor.